← America’s Story. In Just 6 Words. This entry was posted in Beach, Looking back, Real estate, Restaurants and tagged 201 Main Street, 223 Hillspoint Road, Cafe de la Plage, PEN Building Company, Peter Nisenson, Positano's restaurant. Bookmark the permalink. This is such a shame. It could have continued to be a restaurant, a real beach front location. Most of the neighbors didn’t have an issue with it being one. But a deal was struck with one who simply would not stand for it and that was that. Kudos to the many folks who sat down and had meetings in trying to find a way to make it work out. So all that’s left now is Elvira’s. That might not last much longer either….. While nothing like these would ever just start up now where they are, that they are there and part of the community and integral is marvelous. 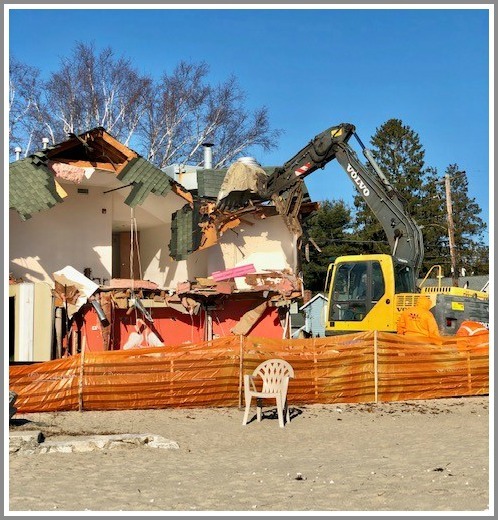 Café de la Plage now joins Chubby Lanes, Allan’s Clam House, Grubs Mkt, and the Penguin Inn in our collective memories of a more active and all around experiential experience Compo Beach area. Was the Penguin Inn the place that was rumored to be a house of ill repute…?! Realize I should have been more specific in my comment above: “accompanying rain” etc. is inadequate. The torrential rains which came with this storm caused many rivers to overflow, with dams, bridges, even houses swept away. Terrible destruction and the end of the era of CT colonists’ early dam and bridge building, of random rocks, tree trunks and whatever else was handy. Thank you for sharing your memories, Bonnie..
Had my fingers crossed that this would not happen but knowing what Westport has become I should not be surprised. Sad. What a shame. The charm is being depleted in this town and the heart and soul, that left long ago, is being replaced with superficial emptiness. We lived up the hill from the Cafe de la Plage, on Buena Vista #2.. . Our lovely old cape cod was leveled too; a modern something stands in its place. Most of us on the street had young families; our kids could safely ride their trikes on the dead end street with our dogs running freely after them, playing. Pushing strollers up Compo Hill Ave, from Mill Beach kept us in shape, as did pushing same with picnic dinners to weekend bbq’s on the beach and to the firework ( with steamers from the Black Duck!). Every Sunday was brunch at the Cafe, no matter the weather or season. I can well remember near hurricane wind and waves pushing against the windows … it was part of life on the beach. We asked for stronger bloody Mary’s and slurped down our eggs Benedict. I will NEVER understand why a restaurant there would not be a smashing success, as was the Cafe. Positano’s was just the wrong place. We were and are foodies. With that view and good wholesome food, there would be lines waiting.. I dined at Positino’s only a couple of times during its reign, and the meals were beyond fabulous perfection (if that’s even possible, LOL). Only went occasionally due to my location in life at the time. The atmosphere seemed a bit cold and perhaps noisy/echo-ish, if memory serves, but ah … the food! Really a shame that a new eatery couldn’t have taken its place. And man, do I ever miss Allen’s Clam House. That place oozed of rustic New England. Was a gem. 😦 Is there any beachside dining left in Westport? Pearl at Longshore (if you consider that a “beach”). Riverside dining: Bartaco, Arezzo, Rive Bistro, The Boathouse at Saugatuck Rowing Club, Parker Mansion, The Black Duck. Thanks, Dan! Good list to keep on file. I love the river — that was mainly our side of town on Bridge St.
My husband and I had many romantic meals in the beautiful setting of Positano’s. We loved taking our children there for many years on Christmas Eve and other special occasions too. I sang there in 2013 for a few times and loved it. The family of Positano’s was so warm and kind. We have missed it so much. Need to try the new one more often but miss our Combo beach setting. My future husband and I had our first dinner date at Cafe de la Plage in 1976 and returned there for celebrations, including to Positano’s when Leslie Orofino was performing. So sorry I can no longer even walk past the venue of such happy memories, they are only in my head.